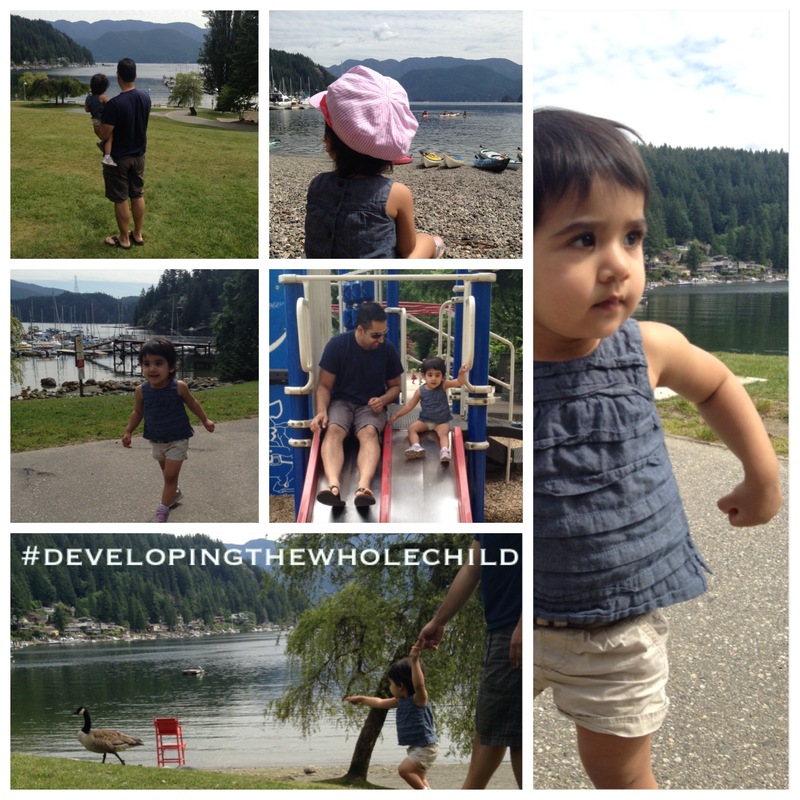 Before the Night Market, we had spent the morning in Deep Cove. Tucked away in the Easternmost point of North Vancouver is this hidden gem. This peaceful paradise was an adventurous playground for R. She urgently chased a family of geese, discovered the ship-themed playground, watched kayakers while hanging out on the rocky beach and ate some greasy Hawaiian pizza on an outdoor patio! On our next visit, we look forward to doing a family friendly hike along the Baden-Powell Trail up to the Quarry Rock look-out and some kayaking in the sheltered, still waters of the bay. These little friends, born a day apart, played gleefully in the warm sand on Saturday morning. What one did, the other copied. Sand was dug into, scooped, dumped and thrown. The adults got to enjoy a delicious meal at the Boathouse Restaurant while these two quietly coloured and munched on their lunches. I always bring extra food with me, things I know she will eat, since R is such a picky eater. She did enjoy some breaded chicken and yam fries we ordered for her :). The Boathouse has spectacular views of the beach and North Shore Mountains and is definitely a place we love to eat at! On Saturday evening, at the foot of the Vancouver Art Gallery, flocks of people gathered to enjoy the festivities of the Vancouver International Bhangra Celebration. 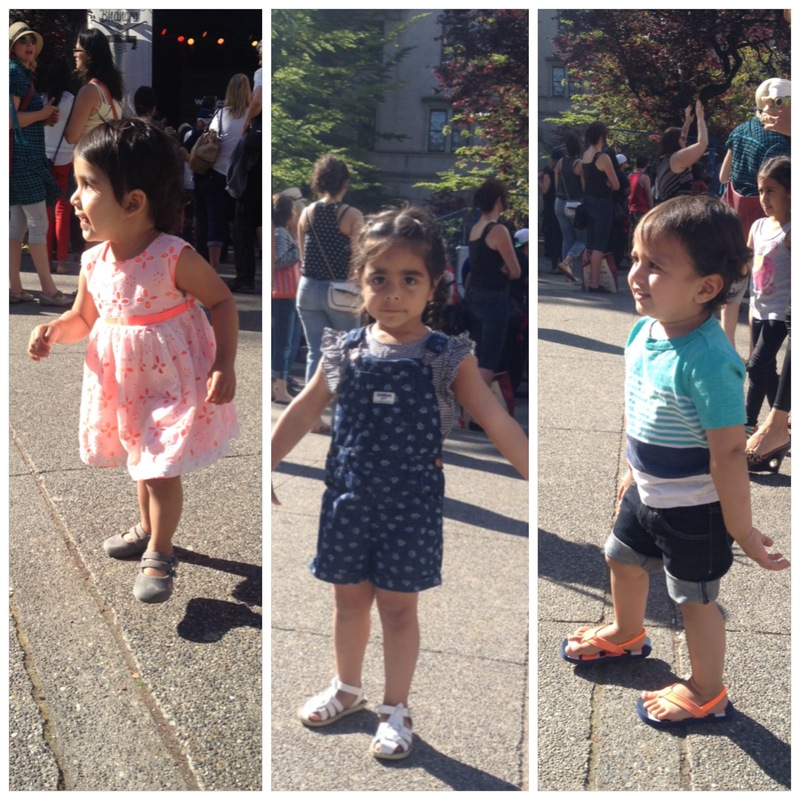 These three munchkins danced along to the rhythmic beats. R’s initial hesitations turned into carefree prancing. It’s always a joy to experience the rich diversity in Vancouver. The Bhangra music brought together people from a multitude of backgrounds and together, they laughed, danced and listened. 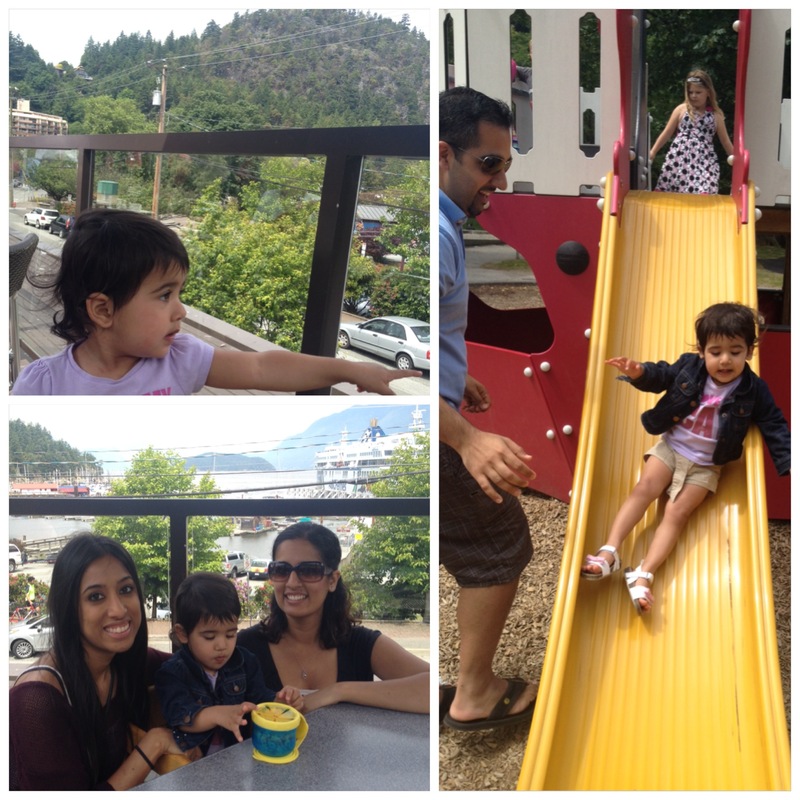 We headed West on Sunday Morning to the picturesque community of Horseshoe Bay. The roof top patio of Bay Moornings was the perfect place to enjoy lunch, cocktails and 180 degree views of the bay. R’s day is not complete without spotting the many birds perched high in the trees and on the roof tops. The horn of the ferry thrilled her as she waved goodbye to the passengers. Our favourite place to eat here is Olive & Anchor, but we tried something different with Bay Moornings. The food was a bit bland for our liking, but nothing a little hot sauce couldn’t fix. I love how much you are exposing her to! I can Imagine her little mind going at hyper speed taking it all in! 🙂 I try to the same for my children. It I s so good for them to experience these things, even at a young age. I can definitely see her processing the sights and sounds when we are out. She is always much happier when we are out! Ԝhat’ѕ up, this weekend iѕ pleasant for me, for thee reason that this point inn tim i am reading this fantastic informative post here at my residence.